Brady Hall's doves on terra cotta eaves plugs. WE'VE WRITTEN BEFORE of the special design of the Chalon Campus' first building, Brady Hall, and its architect Mark Daniels (Spanish Chalon, Water Features, and Together Again for the First Time). 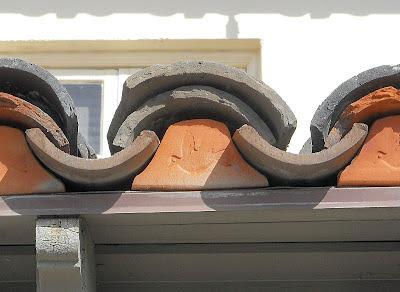 One of the nicest and least-noticed features are the eave closures -- small plugs that tuck under the pantiles where they reach the edge of the overhang. Each one is stamped with a dove on the wing, a symbol of the Holy Spirit. The doves appear even where they're not readily visible. Next time you're at Brady, take a moment to enjoy the thought and care that went into creating this beautiful environment.